The days of minimal to no makeup are just around the corner. I take full advantage of that letting my skin breathe and just be. 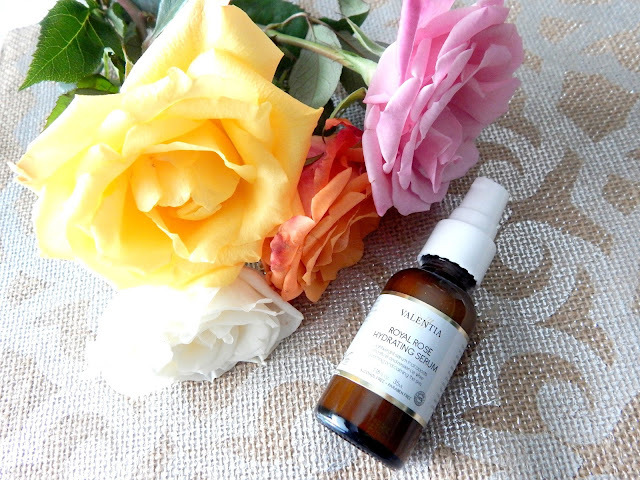 Because of this, I have been prepping my skin with Valentia Royal Rose Hydrating Serum. This has been helping to moisturize my dry skin that is still recovering from the winter chill. It makes my skin feel soft and hydrated with a slight coolness once applied. My normally red and irritated cheeks appear to be evening out in skin tone and texture. It helps give my skin that glow and radiance that Spring skincare and makeup is all about. This serum is made with selected ingredients that work together to achieve great results. It is rich in Vitamins A, B, and C. True to the brand, it is made with natural and organic ingredients that help protect the skin from further damage and repair the skin from any outstanding imperfections. I like to have a leg up on the next season and start to prep for the change with ample time before the transition is done so my skin has time to adapt to the new skincare items. With this serum, my skin has no adjusting period or irritation. As an added bonus, the light rose scent is extremely pleasing and not overpowering. Start prepping your skin now so when the first late outdoor party of the summer is here, your skin is ready to shine. *This post contains a paid for advertorial for Valentia Skin Care. It really is. It seeps in super quick. Give it a go! My skin is so dry. I have been trying to exfoliate a lot but need to add something like this to my routine. Thanks. Try exfoliating less. Just once a week is what my dermatologist suggested. Yes adding a good serum or face oil will do wonders for your skin!